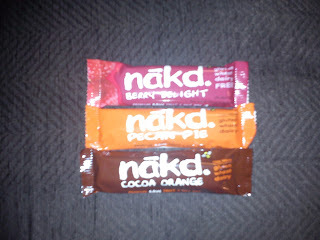 I received three flavours - Berry Delight, Pecan Pie and Cocoa Orange. Because they are snack bars, I was expecting crunchy, oaty type things, but in reality, these snack bars are quite different. The snack bars are soft, chewy and cake like and each bar provides you with 1 of your 5-a-day too as well as being gluten, wheat and dairy free - so they are suitable for almost everyone. They are fairly low calorie too at 135kcal per bar. The Berry Delight was my favourite - it very much tasted of fruit and I really could taste the berries coming out in it. The Cocoa Orange was my second favourite - there was just the right amount of flavour - it was much like a cup of cocoa with some orange syrup in - very scrummy! My least favourite was the Pecan Pie, but I did not dislike it - I liked that a lot too, I just preferred the other two! The Pecan Pie had a lot less flavour/taste than the other two, but I was impressed that the bits in it weren't really big and crunchy. Nakd snack bars are available to buy from Tesco, Asda, Sainsbury's, Morrisons, Waitrose, Holland & Barrett, independent health food shops and www.eatnakd.com at RRP 72p. You can find out more information by visiting www.eatnakd.com. I really fancy the Cocoa Orange one. great that they are one of your five a day too! I am on a diet aswell but seem to have a problem with a lot of these snack bars, they are all around the 100 to 150 calories where as a small choc bar such as a milky way is about the same amount of calories.I always seem to succumb to the choc bar and need to stop this.